These micro Blue Bird servos are optimal due to their low weight, high torque and high speed signature running on a single cell 4.8 volt lipo batteries. 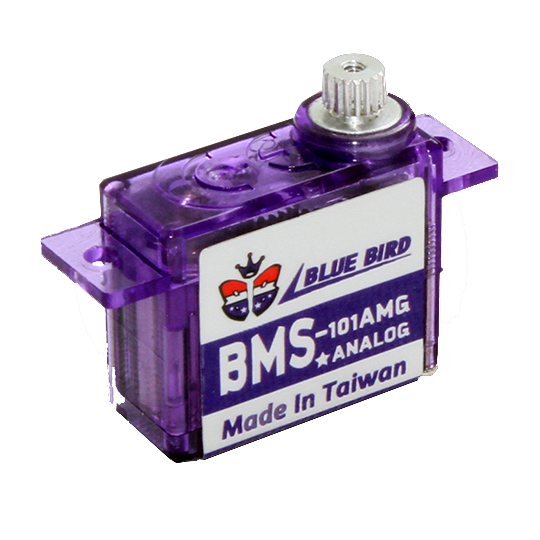 The Blue Bird BMS-101AMG is a coreless micro servo perfect for DLG / HLG / F3K / F3P airplanes, sailplanes and gliders. Weighing at only 4.4grams, these servos offer extremely precise arm movement, precision center positioning makes them ideal for your RC gliders. The BMS-101AMG is self contained with control loop circuitry technology, precise servo position using coreless motors resulting in smoother operation and faster response time. Gears used for the Blue Bird BMS-101AMG are in fact metal gear. All of the main gears are metal not plastic, again making these optimal against gear stripping and a safer and secure way to fly. Plastic gears strip and wear down causing unexpected accidental crashes. Metal gear servos or MG are crash-proof, and have high gear strength providing the user with peace of mind.